For more information on one of the principal Border Collie Registries in the United States, visit the home page of the International Border Collie Association, Inc.
Why should I register my dog with International Border Collie Association, Inc? What do I get in the mail when I register my dog with the International Border collie Association, Inc? When you register your dog with the IBCA, you will receive a Certificate of Ownership, which proudly displays your dogs information: such as name, color, parents name and registration number, etc. This certificate is attractive as it is large. The 8 1/12” by 11” certificate is suitable for framing – many happy dog owners do just that! You will also receive a handsome Lost and Found Tag for your dog that is ready to activate at your earliest convenience. The International Border Collie Association includes this in your certificate packet so that we may begin protecting your dog right away! What other services am I eligible for when I register my dog with the International Border Collie Association Inc? FREE Lost and Found Service. We are excited to offer you a FREE lifetime Lost and Found Service. This service is available 24 hours a day, 7 days a week, and 365 days a year! How’s that for service? When you register your dog with the IBCA, you will automatically receive a lost and found TAG, which you will hang on your dog’s collar. On the front of the tag, it reads I am lost please help. Call the toll free telephone number where operators are ready to reunite you with your dog, anytime of the day, anytime of the year- for the lifetime of your dog. The Lost and Found tag is made of durable plastic that is high impact, shatter resistant, and has a greater degree of visibility. How do I activate this service? Once you receive your FREE lifetime Lost and Found Tag, simply follow the directions in your packet. Your dog’s attractive tag comes in a sealed plastic envelope with your own personal identification number, reserved just for you and your dog. The identification number is ore-printed directly onto your Dog Tag. You can activate this service in two convenient ways: fill out the Owner Information Form and send it to the address listed or fill out the Ownership Information Form and submit it directly online. How do I health certify my dog? It’s as easy as 1-2-3 to health certify your dog using the IBCA Health Certification Form. First take the form to your veterinarian on any visit. Ask your veterinarian if he or she can check the heart, eyes, and teeth of your dog. If your veterinarian can certify that your dog is free of genetic defects in those areas, he or she will sign the appropriate sections of the form. Step Two send the completed Health Certification Form to the International Border Collie Association, Inc. Congratulations on being a responsible dog owner! Step Three, we will take for you. Once we receive your Health Certification Form; we will enter the certifications into the data banks for a permanent record of your health titles! This is a FREE service available to you for the life of your dog. For this reason, you may upgrade the health status at any time for the life of your dog. I have an International Border Collie Association, Inc. Registration Application. Simply fill out your Registration Application. Include the name of your dog, the colors of your dog, and the gender of your dog on the front of the form. Then, fill in your personal information, such as name, address, and telephone number. If there is a co-owner, fill in his or her name (there is no additional charge for a co-owner). Sign the form and if applicable, have the co-owner sign the form. You can mail your registration form to the address listed on the form, or you can fax it directly to the IBCA registration department. For your convenience the IBCA address and toll free fax number is printed directly on your Registration Application. Once we receive your registration application in the mail, it will be processed and back out in the mail to you within 7 working, processing days. However, if you fax it through our toll free 800 number, your registration is processed within 24 hours. I have a dog that is currently registered with another registry, how can I register my dog with the International Border Collie Association, Inc? 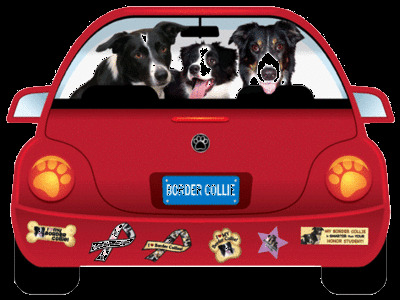 If you have a dog that is currently registered with another registry, you can register your dog using the Border Collie Registration form. This form can be printed out, from your computer, through our Website. Attach a photocopy of your dog’s certificate to the form and fill out your personal information, such as name, address, and telephone number on the bottom section of the form. If there is a co-owner, fill his or her name (there is no additional charge for co-owner). You can mail your registration form to the address listed on the form, or you can fax it directly to the International Border Collie Association registration department. For your convenience, the IBCA address and toll free fax number is printed directly on your Registration Application Form. Once we receive your registration application in the mail, it will be processed and back out in the mail to you within 7 working, processing days. However, if you fax it through our toll FREE 800 number, your registration is processed and in the mail to you within 24 hours. Does IBCA require DNA profiling of breeding dogs, and what is IBCA's position on DNA profiling? This is really a two-part question. IBCA does not require DNA profiling of registered breeding dogs. If a pet owner or breeder has had a DNA profile completed, IBCA offers the opportunity to list that on the registration certificate. It has been the stated policy of IBCA for years that if we ever offer DNA to our breeders, it will be when it is economically feasible. No registry can afford to offer genuine and valid DNA profiling to all registrants absolutely free unless there is a loophole or an exclusionary clause. When DNA profiling costs as much or more than a registration fee, no legitimate registry can afford to loose money for publicity purposes. IBCA will OFFER it (emphasis on "offer") when it is economical enough (and it will be someday). We will let the breeders who want it pay for it. To assure the highest level of integrity, microchips will be required in each dog with a DNA profile. However, even with that, it comes down to personal integrity unless a registry representative physically takes all DNA samples and inserts the microchip. Even then, though, there is no assurance of purebred heritage because the DNA profile of the original dogs cannot determine breed. It returns to personal integrity. DNA profiling is beneficial to the honest but the only thing DNA profiling can absolutely hope to accomplish overall is to provide a public relations tool to those who feel they need it. We will make DNA testing available in the near future, at the breeders expense.